From upgrading equipment and technology to recalculating and fixing trajectories ahead of important space missions, NASA has made impressive strides since it launched 60 years ago. Astronauts went down in history for their many “firsts” — first spacewalk, first to walk on the Moon, first female in space and so on. And now the agency is continuing to explore planets, including sending space exploration vehicles to Mars in search of signs of life. Here’s a look at just some of the historical achievements NASA, and those who were a part of the space program, have made over the past six decades. Alan Shepard became the first American astronaut to travel to space on May 5, 1961. It was a short, but sweet trip to space for Mercury astronaut Alan Shepard on May 5, 1961. With his 15-minute flight in the Freedom 7 capsule, the then 38-year-old became the first American to ever travel to space. Shepard’s journey took place just 23 days after Yuri Gagarin of the then-Soviet Union became the first person to ever go to space. Ed White became the first American to take a spacewalk on June 3, 1965. On June 3, 1965, astronaut Ed White became the first American to ever take a spacewalk during the Gemini 4 mission. Holding onto a 25-foot rope, White moved slowly over the Pacific Ocean near Hawaii. He traveled the length of the rope and back three times — for a total of 23 minutes, NASA says. “I’m very thankful in having the experience to be first… This is fun!” White could be overheard saying on the radio while floating in space. Buzz Aldrin, Apollo 11, 1969: Astronaut Buzz Aldrin, lunar module pilot, walks on the surface of the Moon near the leg of the Lunar Module “Eagle” during the Apollo 11 extravehicular activity. In July 1969 — just 11 years after the space agency opened — NASA successfully completed a moon-landing mission with Apollo 8. 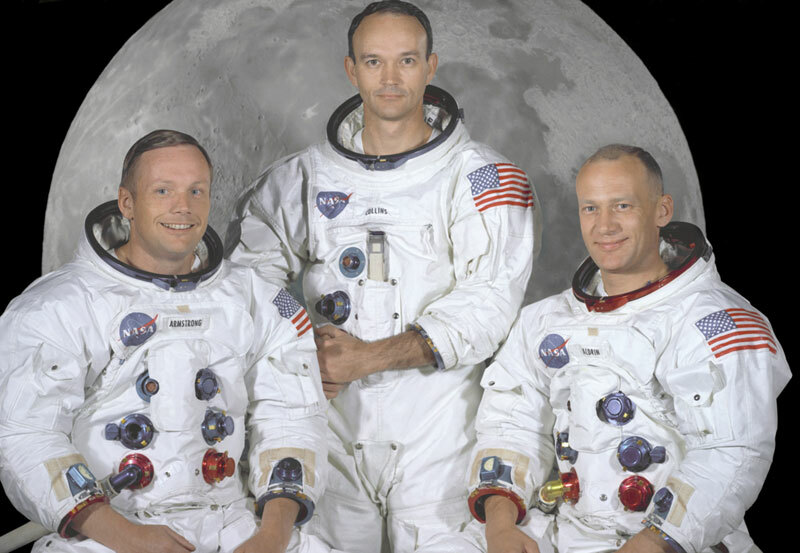 Astronauts Neil Armstrong, Buzz Aldrin and Michael Collins made history. Armstrong became the first man to ever walk on the Moon. “That’s one small step for a man, one giant leap for mankind,” Armstrong told the world as he stepped off a ladder and onto the Moon. Together, the pair explored the Moon for about two and a half hours while Collins orbited in command module Columbia, according to NASA. Before heading home, the group made sure to leave their mark, placing an American flag firmly into the ground with a plaque that marked the date. “Here men from the planet Earth first set foot upon the moon. July 1969 A.D. We came in peace for all mankind,” the plaque read. Shannon W. Lucid, Margaret Rhea Seddon, Kathryn D. Sullivan, Judith A. Resnik, Anna L. Fisher, and Sally K. Ride. Shannon W. Lucid, Margaret Rhea Seddon, Kathryn D. Sullivan, Judith A. Resnik, Anna L. Fisher, and Sally K. Ride — the first American female to fly in space — became NASA’s first female astronaut recruits in January 1978. That same year, NASA welcomed the first African-American and first Asian-American astronauts into its program. The women, however, emphasized that they didn’t want to make a big deal out of their all-female crew. “We didn’t want to become ‘the girl astronauts,’ distinct and separate from the guys. … All of us had been interested in places that were not highly female, and just wanted to succeed in the environment, at the tasks, and at all the other dimensions of the challenge,” Sullivan, the first American woman to walk in outer space, said at the time. Mars $400 million Opportunity rover was sent to space in July 2003. NASA’s Mars Opportunity rover, which was initially meant to only be on the Red Planet for a 90-day mission, has made several groundbreaking discoveries throughout its now roughly 15-year trip. Since leaving Earth on July 7, 2003, the $400 million research vehicle has detected signs of water, explored the insides of two craters and completed a marathon — the first vehicle to do so on another planet. But Opportunity’s journey hasn’t always been a smooth one. In 2005, the rover lost the use of one of its front wheels and got stuck in a thick pile of sand for about five weeks, according to Space.com. When it finally managed to move, it ran into a sand dune. In 2007, a dust storm hit and reportedly cut the spacecraft’s power to “dangerously low levels.” A month later, it turned back on and began exploring the Victoria Crater. Despite its obstacles, the Opportunity has always managed to pull through. However, the rover recently lost signal after disappearing in a massive Martian dust storm over the summer. The dust is starting to clear, but scientists said they can’t guarantee the vehicle will be the same. The Curiosity rover, however, is still going strong. From evidence of a stream to key ingredients for life, NASA’s car-sized Curiosity rover has made some interesting finds since it landed on Mars back in August 2012. Photos fed back from the Red Planet have captivated Earth for years — and in June, officials announced its latest discovery. Scientists with NASA’s Planetary Science Division confirmed they did not discover life on Mars, but did find organic molecules that could provide vital clues in their search. “Organic compounds are fundamental to our search for life,” Paul Mahaffy, director of Solar System Exploration Division at Goddard, said. Over the past six years, the Curiosity has uncovered an ancient stream bed — proving water once ran across the Red Planet — identified methane and traces of Boron in Mars’ atmosphere, captured images of cirrus clouds and found organic molecules. The molecules provide a vital guide for scientists in their search for life on Mars.